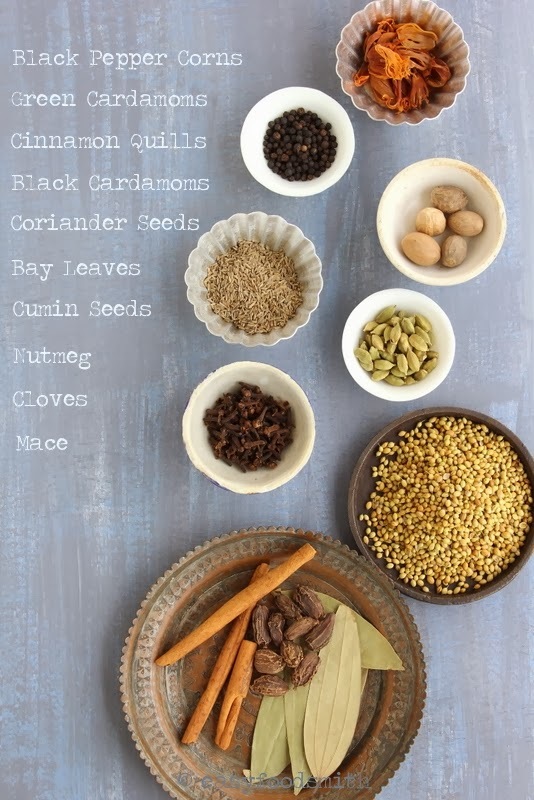 This post was long overdue, especially, considering that I have done two detailed posts last year on the commonly used spices in an Indian kitchen (check here for Part I and Part II). It somehow always took the back seat amongst the other posts. 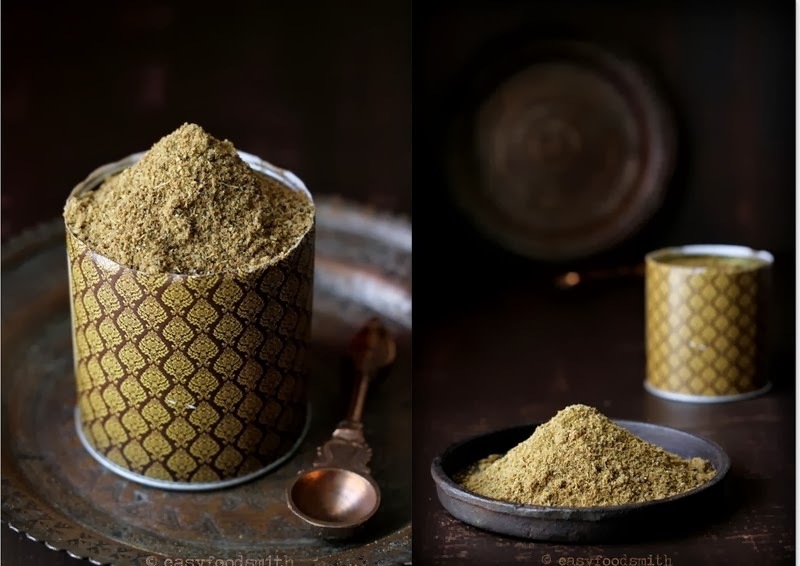 It was high time that I uploaded this post since garam masalahappens to be the most quintessential amongst all spice mixes that have carved a place for themselves on the Indian kitchen shelves. The blend is common to the Indian subcontinent, with slight variations of course. But first, let us understand what the name Garam Masala denotes. Garam in the Hindi language means hot and masala means spice/ spice blend. The blend of the spices, each with its own unique characteristic and therapeutic value, lends its flavour to the garam masala spice mix. Most of these spices have a warm effect on the body. Rather each has its own health benefit for the body when added in a small amount, as in the garam masala. It is always easier and convenient to grab the garama masala pack from the store, however, to enjoy the robust and truly aromatic flavors of the garam masala, I suggest you grind your own at home and transcend to spice heaven! You will note a huge difference in the taste of your curries J You absolutely need to ensure that you use the freshest available spices. Check my previous two posts (here & here) to understand the characteristics and benefits of these spices and how to check for their freshness. Every family has its own spice blend; the key ingredients are more or less the same with some variations in quantities. Since the home made one is stronger in its aromas, a little goes a long way as compared to the store brought ones. Also, it depends on the kind of dish the garam masala is being used for. A hearty meat dish or curry may require a generous pinch of garam masala while vegetables or fish need just a subtle hint to ensure that the flavors of both, the dish and the garam masala shine through in a harmony. Rest, it depends on individual preference how much amount of garam masala one prefers in a curry, dal (lentils) or other dishes. 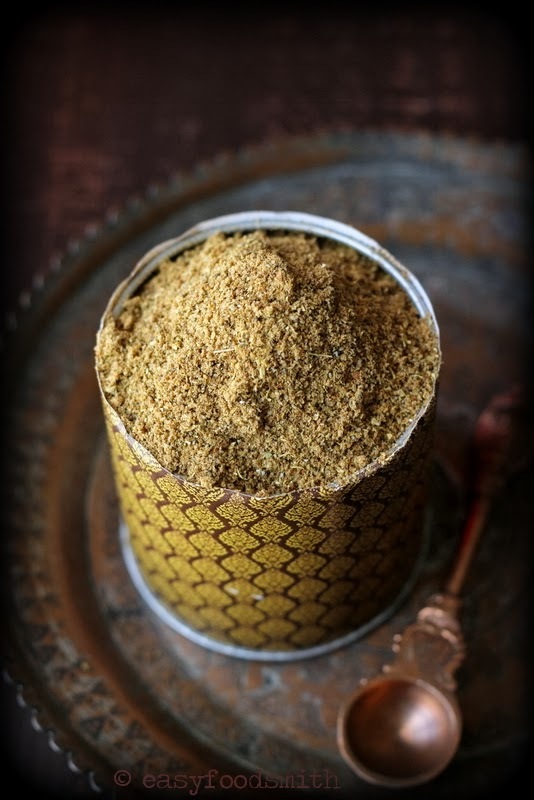 My memories of the garam masala made by Mum are that of keeping the whole spices covered with a muslin cloth out in the sun for ‘drying’ and then grinding them with a mortar and pestle; the traditional way. You, however, can use the spice or coffee grinder to do the job. Very lightly toast whole spices (except nutmeg and black cardamom seeds) in a heavy bottom pan or wok on a low medium heat. Transfer the spices on a plate and let them cool. Transfer them to a grinder and grind to a powder. If you want a fine powder, feel free to sieve them. I prefer a slightly coarse powder (as shown in the pic). On grinding the spice mix may become somewhat hot, let them cool and then store in a dry container. Keep the container at a cool dry place. Note: If you want to dry the spice in the sun, keep them in sun for 2-3 days and then grind them. Note: Ground spices tend to lose their flavor and aroma if kept for long. I usually make small batch, as this one, to ensure that I always get to use spices that are packed with flavours. the shelf life is maximum 2-3 months depending on weather and storage. Note: A word of caution – too much garam masala in your food can be pretty over powering so use less amount initially so that you can adjust the amount later accordingly to suit your taste. Oh god, garam masala is just simply out of the world, this is something i always want to prepare at home.Can smell the aroma from here. Lots flavors with amazing clicks!!! We love garam masala. Have to give your recipe a try soon. I am in love those pics Taruna… They look awesome! Great presentation and photos. A favourite spice to sprinkle to give it that extra flavour! Thanks dear! It sure adds a new dimension to the dish. I often come across the question do you use curry paste, it takes so much time to explain that each house has their own combination of spice for each curry.After moving to US I find that most masala powders available are 1 or 2 years beyond expiry date so I started making my own fresh one with the help of a coffee grinder and gosh what difference it makes! Awesome post Taruna.I just had to read part 1 and 2 learned many things I didn’t know thank you for doing such detailed post. I’ve never made garam masala. I use but not often, so its the convenient way with store bought one. The next round, I shall try this home made version, store it and use as and when needed. Spices just uplifts the flavors of any dish. Aromatic & full of flavours…homemade spice powders are always good…loved your clicks …. I love making my own spice blends. They are so much better than most of the blends you buy at a grocery store. Garam marsala is not a blend that I use much, because the few that I’ve tried have too much cinnamon for me. Yours looks like the cinnamon is just an accent. Need to give this a try! BTW – Your pictures are awesome! I especially love the one of the ingredients. Thanks MJ! Absolutely…home made foods are always better. Just like you, I too do not like too much cinnamon in the garam masala. I try to strike a balance of all spices in my Garam Masala preparation. I hope you like this one. So before I got married I didn’t know that Garam Masala was a mix of spices and that it could easily be made at home! After getting married my mother in-law told me that they make their own garam masala and I was shocked… LOL! Needless to say, I make my own now too. I can imagine…there are foods that we never think can be made at home. how amazing u r at clicking pics.. Thanks for showing us how to make it! I am keeping this to try! Wow!! Three cheers !!! Garam masala had by now become grandma’s flavours. I hv been relying on ready made ones which r no way near to the original aroma…!! I’ve never made my own garam masala. It must smell lovely as it’s being ground! The aromas are truly awesome and in case of home made one, a little goes a long way. One of staple seasoning in my spice rack!!! i love to use it on pan fried fish, scallops or even beef steak too…. GORGEOUS photos! 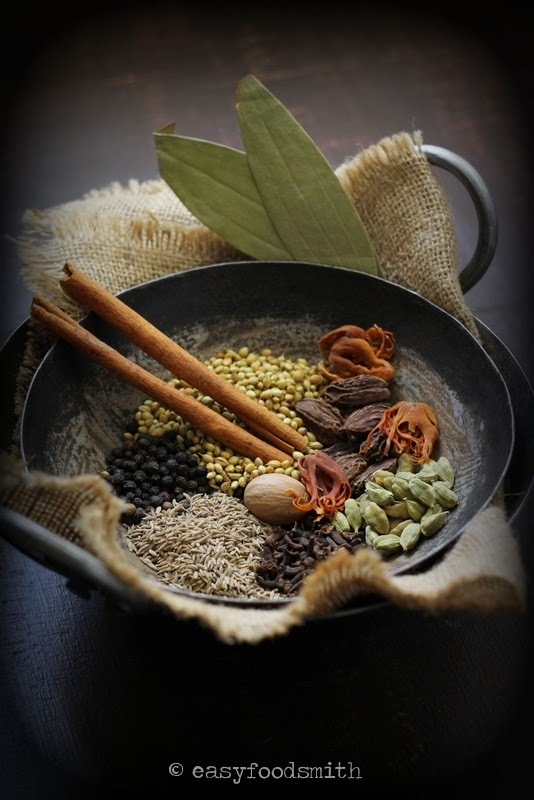 Love the ingredients that make up your aromatic garam masala! I too make small batches of Garam masala and store them to use in curries. Loved the 3rd picture especially the one in the right side. Nice to have your recipe….I am using some already made up from Williams Sonoma, which doesn’t hold a candle to yours, but I hate waste. When that’s gone….I’ll try yours. One’s own spices blends are the best. I’ve made garam masala before, but I’m guilty of too often buying a store-bought version.Your blend looks terrific, and I definitely need to try it. Thanks. I have always wanted to make my own spices, but never got around to it 🙁 This looks so good! Making ones own spices is really easy actually. ohh me encantan las recetas con especias me gustan todas… ùltimamente estoy usando bastante el cardamomo todos son muy aromàticos,preciosas sus fotos abrazos y saludos. So true! Garam Masala is truly the soul of Indian dishes. A friend of mine who’s originally from Mauritius gave me some of her home made garam masala. SO different from what I get in the grocery store. I told her it was nearly alive and she knew exactly what I meant. Such beautiful photos of the masala! Its funny, my mum never had a “blend” she just used to sprinkle this and that and the food tasted great! Of course, as a result, I don’t do it either, but I really should. The only mix I make is for my Hyderabadi biryani and keep that in my pantry ready for nihari or korma or biryani. 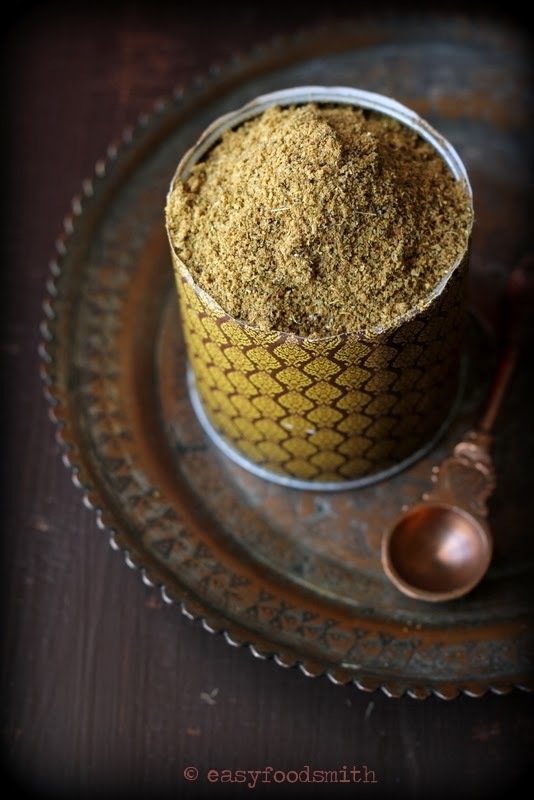 Love making garam masala at home too! Your pictures are just gorgeous! Very useful post Taruna love it. Thank you Swathi. I am glad you liked it and found it useful. Thanks Juliana. The blend is really aromatic. This is slightly differs from mine but will try yours next time, Great photos! beautiful pics. i have to make soon. admire your metallic plates collection.